We all like to show off at some point, especially fisherman… how big was it? That’s why the product development team at Profishent Tackle set out to develop a range of fishing shirts for sale that were designed with a purpose, to show off, to stand out and to be different. The Barra Shirt – it’s not just any old plain barramundi stuck on a shirt. The detail is exceptional. From the baitfish jumping to the archer fish in the background hidden within the snags to the mud crab trying desperately not to become the barra’s next meal. The bluewater shirt with the marlin and dolphin fish on is simply stunning. Just look at the mackerel finish on the sleeves. Profishent tackle shirts are different, amazingly different. Murry Cod fisho’s, just look at the amazing artwork of the murray cray that is about to become breakfast to the cod that just pops out at you. Designs aside, these long sleeve fishing shirts are made from only the highest grade of knitted polyester that’s highly durable, is light weight and cool. Why not show off, fish in style and help keep the harsh sun off your precious skin at the same time. Unisex – They can be worn by either ladies or gents. 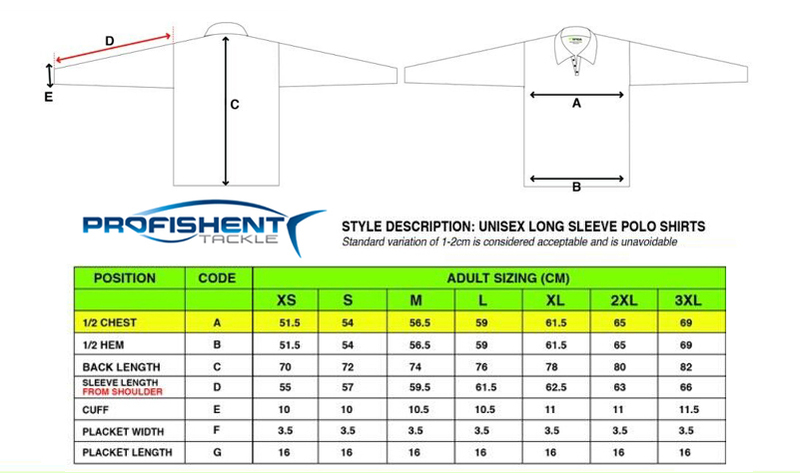 Click the button below to add the Profishent Tackle Fishing Shirts to your wish list.